I had really been hoping to do a double on this Saturday. Southport were at home to Blackburn Rovers (Southport are the only Conference club I have yet to arrange a visit to). But Anwar had to look after his kids and I wasn't going to be able to justify all that time and expense on my own. 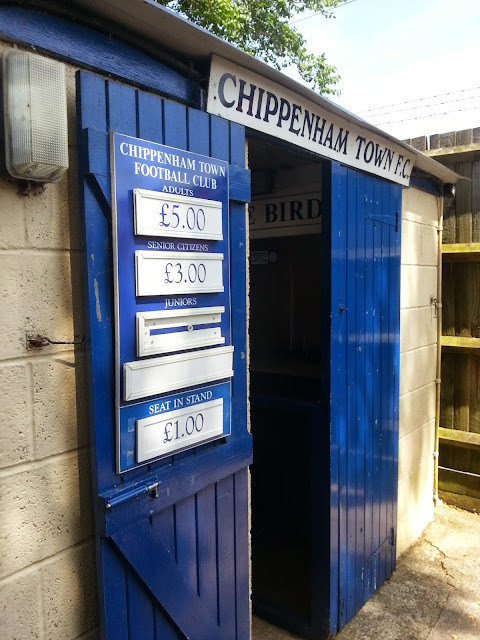 So after looking at a number of options, I settled upon Chippenham Town v Ipswich Town, as there was a possibility that people I knew would be OK, plus it wasn't that far in the grand scheme of things. Despite me starting my pre season 2 weeks ago, there was still a lack of matches that fitted my criteria - a step 1-4 team that I had not been to. 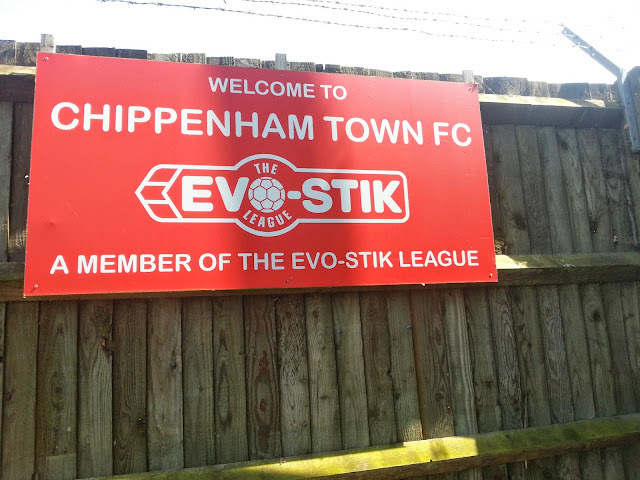 I was certainly hoping for better luck than last time I went to Chippenham. A familiar scenario of last season. Scores of matches called off and very limited for choice. Chippenham said their game against Leamington would be on, only for yet more rain to fall, and the referee didn't fancy the conditions, so he called it off, meaning that me, around 100 Leamington fans and assorted others had travelled a long way for nothing. The game was kicking off early at 1PM, but even so, there wasn't much about, so I wasn't looking to do 2 games like I'd usually be itching to. That said, I am writing this on the Thursday afternoon, and anything can change. I was however, hoping to tick off a couple of ciders at the Wetherspoons Cider festival. The pub chain had come up trumps this time, with 16 available, 14 of which I had not tried, or had not bothered to note down. And all at a very reasonable £2.29 a pint, at least in our local one anyway. The town and the Wetherspoons were less than a mile away, so it was all shaping up pretty well. As it was I went out on the Friday night and had a few pints, all at a bargain price. Well apart from the last one where I got a bottle of Cherry Beer at the Bootlegger pub that cost an eye watering £5.20, but it was very nice. The evening ended on a sour note however, as I stood waiting like a lemon for a bus for 50 minutes that didn't turn up. I got to the bust stop at 22:10, the bus was due at 22:34. I gave up at 11 o clock, walked halfway home and got a taxi for the rest of the way that ended up costing me a fiver. On top of the £3.80 'return' bus ticket. I woke up really early on the day, something that I constantly do. As I get up at 4am every day, my body clock wakes me up early, meaning I hardly ever get a lie in. I watched last nights Coronation Street, a few Youtube videos and then had a bath and pottered around until 10am. I left and met mate Sean in Swindon, before driving onto Chippenham and arriving around 12.20. It was a scorching hot day and we walked around the ground taking photos before finding a spot in the shade. I also visited the club shop, getting some old fanzines and a pen for £3 and went to the tea bar, opting for chips at £1.50. I had no idea of the line ups for either side, as they were neither displayed, broadcasted on Twitter or read out over the tannoy, the only clue being that Ipswich were fielding a young side. It wasn't the best of games, the sizeable Ipswich support amongst a crowd of 415 would have been sent home fairly happy as they won it 1-0 in the last minute. 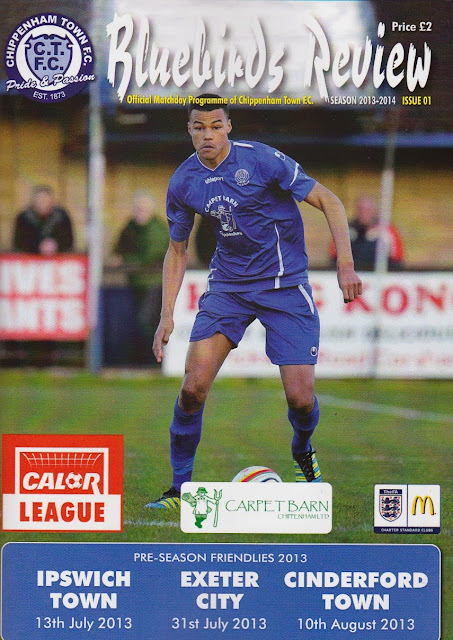 This despite Chippenham being by far the better side, but lacking in the final third, as well as hoofing it a fair bit. They struggled last season and perhaps that's the reason why. The ground and the club are certainly set up for bigger things, but have been let down somewhat by the teams results. It had been a decent day, despite the lack of onfield action and not doing much apart from going to the game. I left the ground pretty rapidly and after dropping Sean off, drove home, getting in at 4.40. Despite trying to trim my costs this season, I had already spent £98.60 on the 5 pre season games I had been to, plus £242 on my season ticket for Wycombe, compared to last season at this point when I hadn't had to buy a season ticket and had spent around a tenner less. Today's cheap £5 entry certainly helped offset the expensive costs that come with travelling. 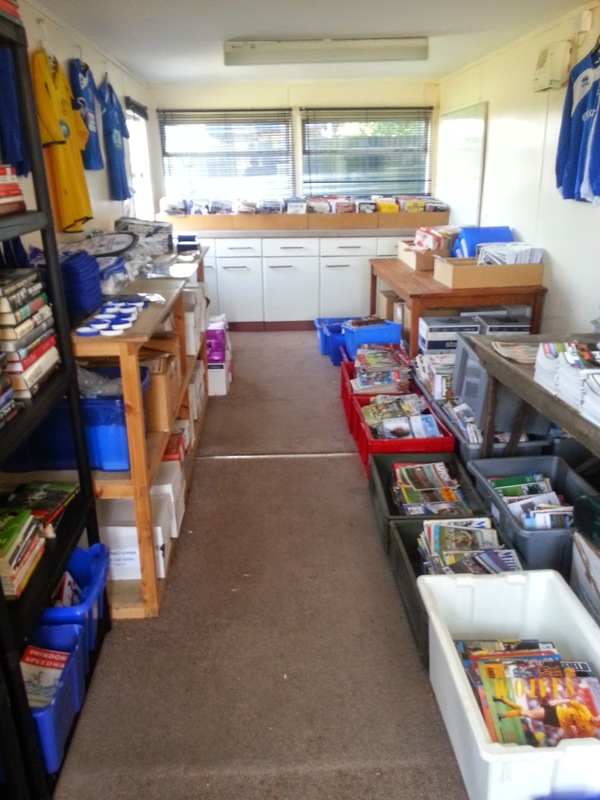 The club shop is excellent, having a huge range of old programmes, fanzines, magazines and other clubs badges. There is also a good range of club merchandise at good prices. I'd rank it as one of the best in football. The tea bar is great as well, having a good range of nice food at reasonable prices. I only took a quick look in the bar, but that too looked very good, with plasma TV's and a better range of drinks than most clubhouses I have been in. All in all, well worth a visit, especially as you can park at the ground and walk less than a mile into town, to try and make a real day of it. The club are pretty friendly too, and they have a delightful accent as well!